The year is really flying by and November seem to have accelerated the speed. I know, there are 24 hours in every day but boy, the items added to our to do list gets longer and longer as we speed toward Christmas. I do have one more Christmas card made. Thanks to Debs and her choice of theme for November - Embossing Wet or Dry. I'd love to see what you create, so how about it... share your creation with Sparkles Christmas Challenge. For my card I dry embossed the background with Stampin Up Softly Falling Embossing Folder. I then die cut Poppystamps Wooded Glen Landscape #2084 and dry embossed it also. I used 3-D mounting squares and added it to the base of the card. My next layer is houses from the Stampin Up Village. I rubber stamped the "To The World" from the Poppystamps clear stamps #CL467 on the bottom of the Village cut. I used 3-D mounting squares to adhere this layer to the base of the card. 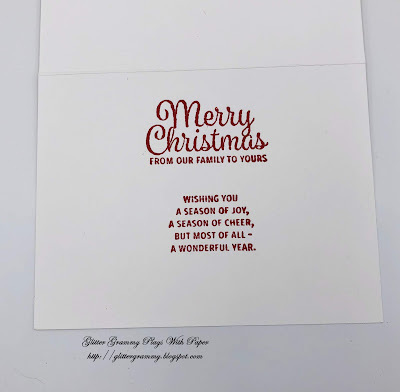 I rubber stamped the word "Joy" using the same clear stamp and die cut it using the Joy die that comes with the stamp set. An easy card to make and I must say...I like it! I kept the inside very plain. I direct stamped to paper my sentiment. Nothing fancy, I do think it conveys a joyful message. The stamps I used are from Stampin Up - Snowflake Sentiments. I hope you take a minute to add your card to the Sparkles Christmas Challenge. It's always fun to share what we do with others and it's especially exciting to see what others are making. Until next time....and it will be the last Christmas card of 2018....have a super crafty month. Take deep breathes and enjoy the cool days, hopefully wet ones for we in the west. The house is beginning to have the scent of baking for Thanksgiving....I'm so looking forward to the holidays spending time with family and friends. This is gorgeous . All those layers are stunning. 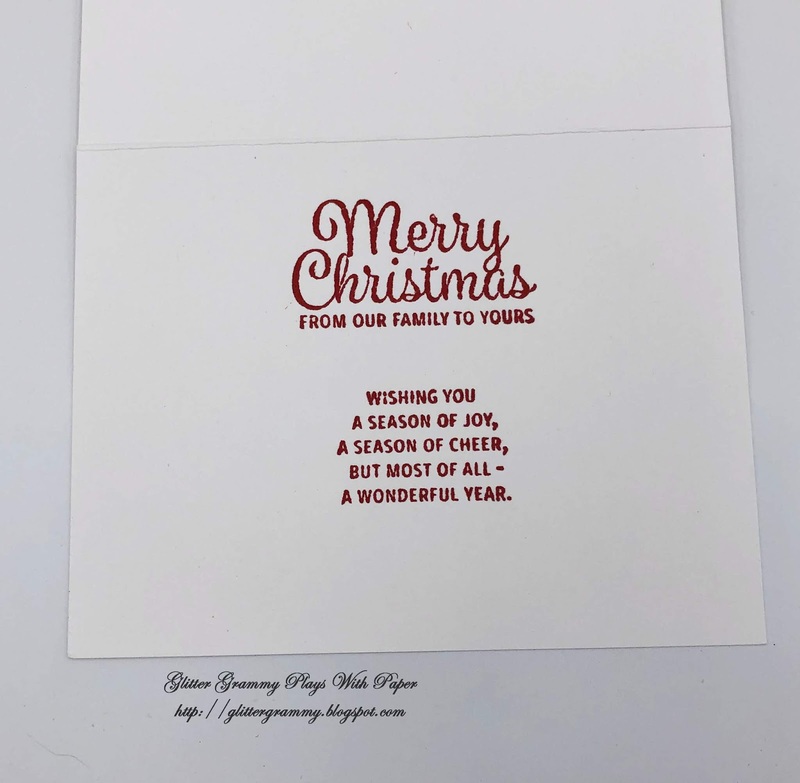 Love how you have just kept the card yo the white and red for the stamping. Hugs Mrs A.